It's funny how life happens. Both Beck and I are not big drinkers. In fact, you maybe surprised that we truthfully have never been drunk before. I give Beck a hard time that she was drunk the night before our wedding in the hotel with the girls, but I don't think even one fruity liquor could get a light weight like Beck drunk. Anyways despite our tastes we now own a vineyard of Petite Sirah grapes. We own a 5 acre parcel and we have 4.5 acres of grape vines. We have entered harvest season and they are absolutely beautiful. Here are some fun facts about Petite Sirah. Petite Sirah makes a red wine that goes well with dinner. It is really good if you're having BBQ pork ribs (my fave), brisket, chicken or steak. I've learned that the flavor of the grape is locked and emerges out of the skin and unlocks a fruity berry tasting wine with a hint of bacon. Now when I read in a wine description that this wine has a hint of bacon I immediately thought of how the comedian Jim Gaffigan said, "Bacon is like meat candy for men!" Pretty much as long as the word bacon is used in any food description you know that it is going to be good. 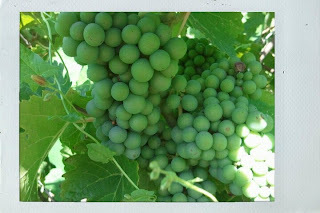 The Petite Sirah is a grape that is high yielding, which means the vines produce a lot of fruit. The Petite Sirah is only grown in four parts of the world: France, California, Israel and Australia. Over 90% of all grapes grown in Israel are in fact Petite Sirah. Some Zinfandel wine makers add Petite Sirah to their creations to create the perfect blend of Zin. A man with the last name of Foppiano came from France in the 1850's and planted Petite Sirah in California. 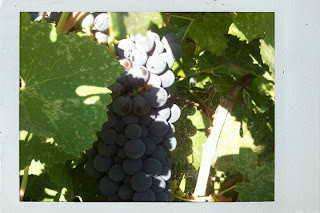 Petite Sirah is a unique grape because it is "Mildew Resistant." Many farmers battle "mildew" which is kind of a fungus that grows on grapes (and in showers). If you have ever had strawberries or raspberries and left them in the fridge too long, they grow a fungus on them. This is the same fungus that can grow on grapes. Thus when you have this fungus you cannot convert this disease-infested fruit into wine. So farmers spend a lot of time spraying their grapes with sulfur which stops this fungus from growing. 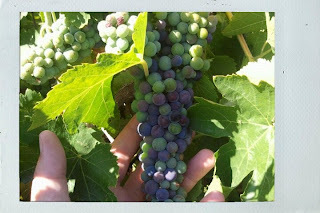 Well the Petite Sirah is the only grape in the world that is Mildew Resistant which means that, although my new grapes were neglected for 2 years when the house went into foreclosure, the Petite Sirah grapes are in great shape and ready to sell because they cannot get this disease. It is one of the most organic grapes you can get because their are no pesticides that are sprayed on the grapes. Here are some fun facts about wine making: Approximately 600 to 800 grapes make a bottle of wine. You can get that many grapes from 8 to 10 grape clusters. Each vine when in production can produce 8 to 10 clusters of grapes each. Each acre of Petite Sirah makes about 4.5 tons of grapes on average. This means our property could produce 16 to 20 tons of grapes. Each ton of grapes produce two barrels of wine. Each barrel of wine makes about 300 bottles of wine. This means my little vineyard could produce 11 to 12 thousand bottles of wine each year. To me that's kind of amazing. Since we first went into escrow in May up until now, I have been able to see the different stages of the grape growth during it's fruiting process. 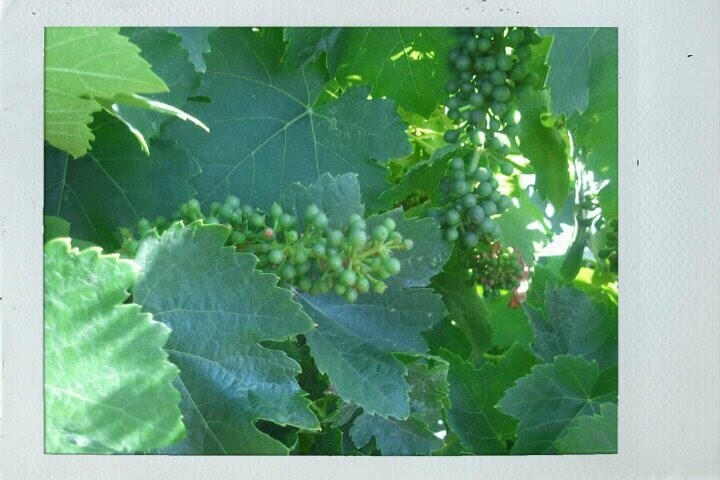 I remember back in early June I called my Dad and said, "Dad, this property is going to have a lot of grapes! "because I saw the buds blooming on the vines. Now that those blooms are now grapes I can tell you that despite their neglect they are doing well and we should have a good harvest this year. This short picture chronicle has been over the last 8 to 9 weeks or so and we are entering into harvest season. Only one problem I have now: What am I going to do with all of these grapes? !